Over my years in the San Fernando Valley, the Claretian Seminary in Calabasas has changed hands many times. We'll need a Calabasas expert to fill us in on the several organization who have called the property in Malibu Canyon their home. For some years people referred to the place as Claretville. It was in actuality a novitiate (training school) for the Claretian Order of the Roman Catholic Church. 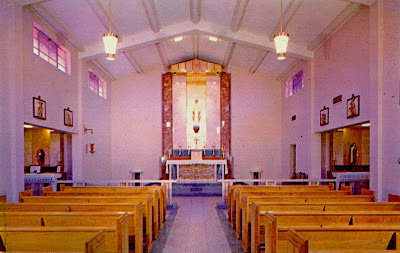 This postcard in the Religion Collection of The Museum of the San Fernando Valley (Chaired by Liane Schirmer) shows the main chapel of the Immaculate Heart Novitiate. The Claretians were founded by Saint Antonio Maria Claret in 1849. Their initial work began as missionaries in Catalonia and the Canary Islands. San Antonio Claret became the Archbishop of Cuba and focused the order as missionaries in Spain and Latin America. How and when the Claretians came to California and Calabasas isn't known by your Museum at this time. SORRY, COULD NOT FIND E.MAIL ADDRESS TO SEND THIS AS PDF TO. HOPE IT SORTS OUT IN A READABLE FORM. 7,500 B.C.E. - 1780s A.C.E. - ‘Talepop’ - the Chumash village, thriving for 9,000 years until European conquest takes away their land, spiritual customs, and ways of life and livelihoods - but gave diseases, enslavement, persecution, and deaths of genocidal proportions. 1952 - The Missionary Sons of the Immaculate Heart of Mary in Rome, aka: the Claretian Order or the Claretians, purchase the central 120 acres with the buildings. 1954 - The Dominguez Seminary and Cala Ranch deeded all the Calabassas land to the Claretian Theological Seminary of Claretville. It was located here for 25 years. 1962 - the Claretian Theological Seminary deeded portion of estate to the Immaculate Heart Claretian Novitiate. The Novitiate Building had already been built in 1960. 1971 - Thomas Aquinas College opened at Claretville. Previously locations were Columbia Univ. in NYC and Dominican College in San Rafael, Calif. Around 1975 they moved to a permanent campus in Santa Paula. 1960s-70s - Impacts of Vatican II and social activism affect American Catholics, and so the Claretians too - with declining monastic resident counts and less participation at the Seminary. 1977 - the Claretians sell the property to Elizabeth Clare Prophet's “the Church Universal and Triumphant” or CUT. Site was renamed ‘Camelot’. Poor stewardship prevailed, most of the property’s lost integrity occurred during CUT’s 9 years here. 2004 - Soka University sells property to a consortium of local, state and federal park agencies and open space organizations. 2007 - The King Gillette Ranch Park opens to the public. 2009 - The Park’s many public events and programs are very succesful. Research is done for registered historical designations and both architectural-landscape-cultural and natural habitat restoration master planning. An interim stewardship program to stabilize the historic and natural elements is in development and implementation. For additional information, Contact the King Gillette Ranch at (310) 589-3200. BIG CHANGE IN LA HISTORIC PRESERVATION RULES! MICHAEL WHITE ADOBE IN IMMEDIATE PERIL!